The US women’s team defeated Canada, 3-2, in a shootout to win the gold medal. 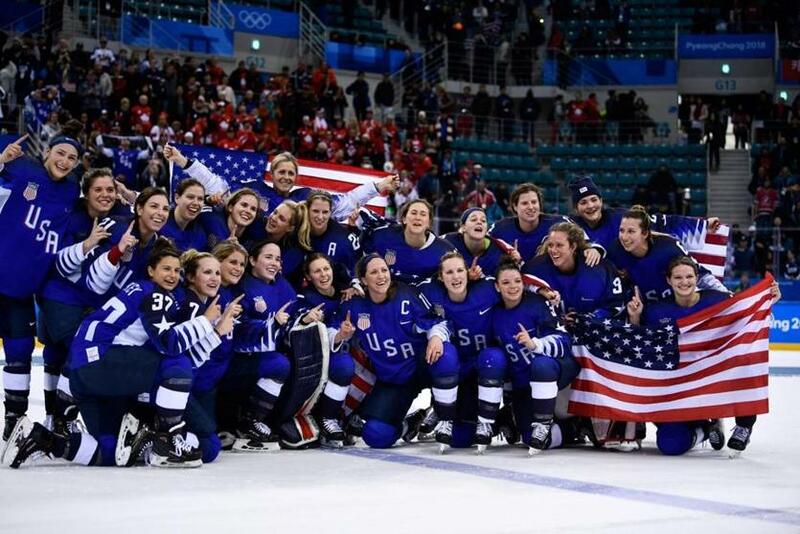 PYEONGCHANG, South Korea — America’s greatest Olympic triumph of the 2018 Winter Games happened in the wee hours of an East Coast morning, leaving the home audience to relive the magic of the women’s hockey team’s gold medal through next-day replays and postgame conversation. America’s greatest South Korean Olympic nightmare happened smack in the middle of prime time, inviting the home audience to witness the horror show that was women’s figure skating, a splat-fest free skating display so predictable and expected that the three American entrants were not even in the telecast’s final grouping. No wonder we are hearing that the buzz back home is that there’s really not much buzz. When the best showing happens while no one is awake, when the worst showing is there for everyone to see, what is an American audience to do? Between the difficulty of keeping up with action happening 14 hours ahead and the less-than-stellar showing in the glamour winter sports such as figure skating and Alpine skiing, it can be difficult to get swept up in the magic of what has gone right for Team USA. Like the gold-medal hockey game between powerhouse rivals, a heartstopping clash between the United States and Canada that dropped the puck in the early afternoon in PyeongChang, which meant after 11 p.m. on your East Coast dial. By the time the teams worked through 60 minutes of regulation, one 10-minute overtime, and six rounds of penalty shots to get to the USA’s dramatic 3-2 win, it was almost 2:30 a.m. in Massachusetts, leaving all but the most dedicated viewers asleep in their beds. While NBC, television’s rights-holder, was quick to celebrate the way that game was watched at home, releasing the following e-mail statement in its aftermath — “Wednesday Night’s Thrilling Team USA Women’s Hockey Gold Medal Victory Delivered NBCSN’s BEST-EVER Late-Night Rating With a 2.06 Overnight (11pm-2am ET)” — just imagine what the game might have done (15 or so?) had it been on in prime time. 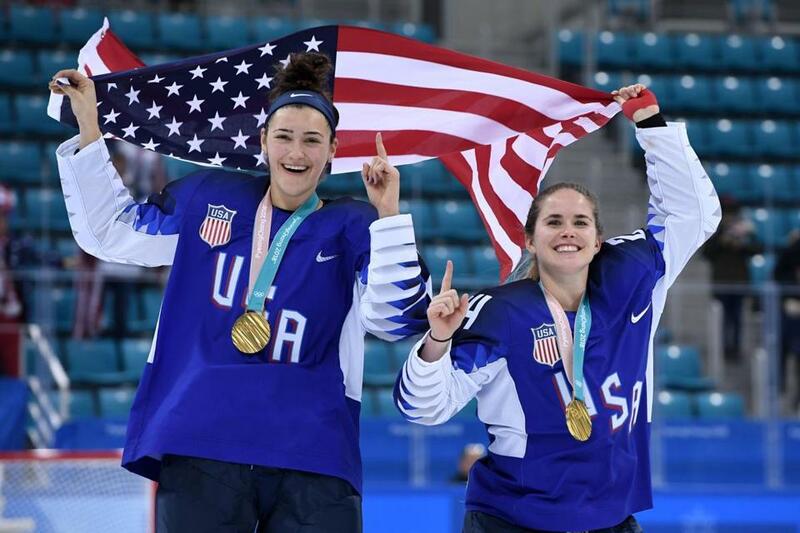 The US women’s hockey team’s gold medal victory over Canada will serve as one of the enduring American snapshots of the Pyeongchang 2018 Winter Olympic Games. What a shame, and not just for the women on the two teams, who deserve to be watched and appreciated for serving up one of the most intense rivalries our sports landscape has, but for the viewers at home as well, who deserved to not be bleary-eyed while witnessing the US clinch its first gold medal in two decades, breaking a four-Olympic string of dominance by Team Canada. Social media certainly did its part to spread the excitement, but at that hour, there is only so much potential audience out there. The curling audience, albeit smaller, was also left to social media to generate buzz for the first-ever gold medal by a men’s team, a stunning overnight win by John Shuster’s team similarly relegated for live consumption by either the most dedicated fans or insomniacs. That Shuster, Tyler George, Matt Hamilton, and John Landsteiner were responsible for one of the best American stories of these Games will at least be reflected in the US medal count, which by Saturday night’s end stood at 23. That was 15 behind leader Norway and five behind both Germany and Canada. However, overall, across 17 days of competition, the US did certainly mint some new prime-time stars. A pair of 17-year-old snowboard prodigies, Chloe Kim and Red Gerard, head back to the States with matching gold medals and similar marketing dreams, breakout performances that got the US off to a rousing first-week start. There were other high points. Fellow slopestyle snowboarder Jamie Anderson also goes home draped in gold. A men’s curling squad known as “The Rejects,” for literally being rejected by the US Federation four years ago, won the gold medal. Cross-country skiers Kikkan Randall and Jessie Diggins won America’s first-ever women’s medal in their sport, and they made it gold. David Wise and Alex Ferreira went gold-bronze in the freestyle skiing halfpipe. 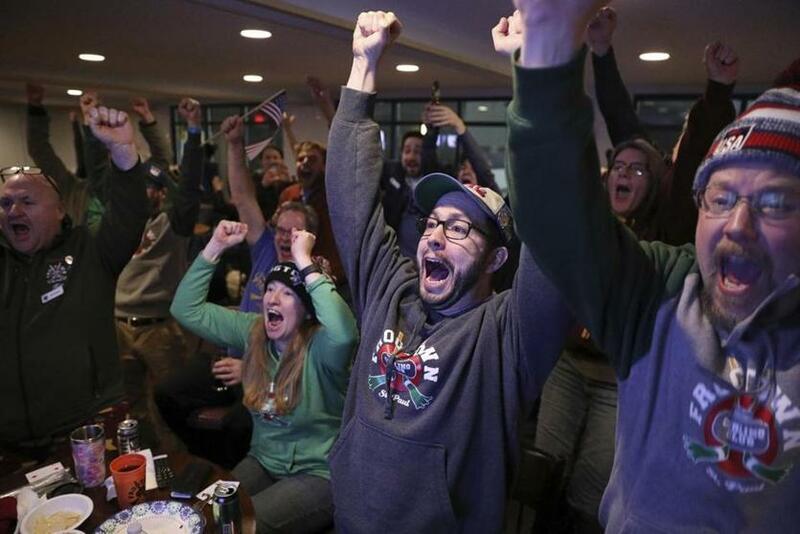 Curling fans at the Frogtown Curling Club in St. Paul, Minn., erupt with joy after watching the US men’s team win Olympic gold over Sweden, 10-7. And there were amazing moments even within defeat. Nathan Chen landing six quadruple jumps in one Olympic routine, Mirai Nagasu landing one triple Axel in hers, Vincent Zhou landing a quadruple Lutz on Olympic ice, all of them making history. Adam Rippon making his first Olympic team at age 28, doing so as an out and proud gay man, and helping the US take team bronze, all of him glowing with inspiration. Ryan Donato scoring goal after goal for the men’s hockey team, all while completing homework for his Harvard classes back home, absolutely captivating. Elana Meyers Taylor winning another silver medal in bobsled, leading a program still sputtering in the wake of the death of leader Steve Holcomb, was simply amazing. 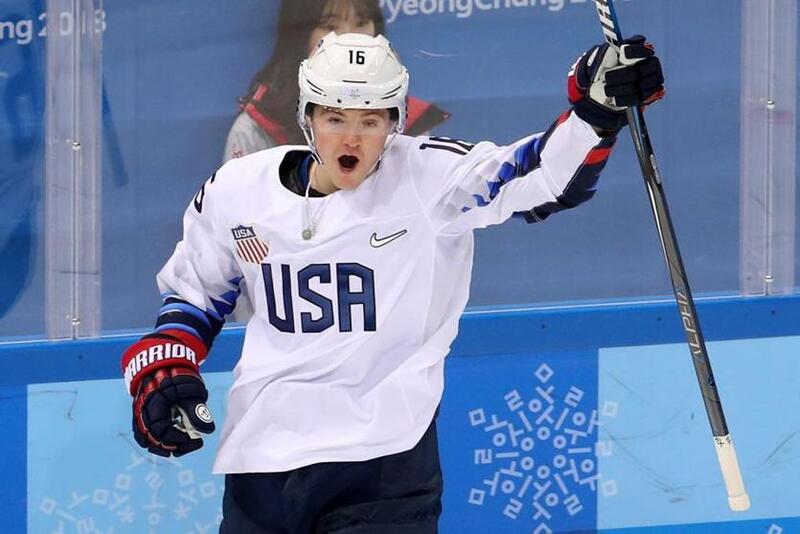 Although the US men’s hockey team came up short in its gold hunt, Harvard’s Ryan Donato acquitted himself well, scoring goal after goal for the Americans in the Olympics. But there are complicated memories, too, such as the ageless and historic performance from halfpipe wizard Shaun White, who won his third gold medal at age 31, but who was left to defend himself, and poorly at that, over a past accusation of sexual harassment by a bandmate. When he initially dismissed the claim, which he settled out of court, as “gossip,” he then backtracked into an apology over his word choice, leaving himself squarely in the crosshairs of the ongoing #MeToo movement of female empowerment, dimming some of the spotlight he’d earned on the snow. For Lindsey Vonn, the most decorated American female skier of all time who made a triumphant return to the Olympics after injury kept her sidelined four years ago in Sochi, speaking out also had its ugly downside, subjected as she was to social media scorn for saying she would decline a post-Olympic White House visit. Now that she’s unlikely to get one anyway, after grabbing one bronze medal in the downhill while being shut out in super-G and combined (American teammate Mikaela Shiffrin won gold in giant slalom and silver in combined), Vonn’s Olympics also end on a bit of a low note. Considering she came in as perhaps the US delegation’s most recognizable face, that was disappointing. 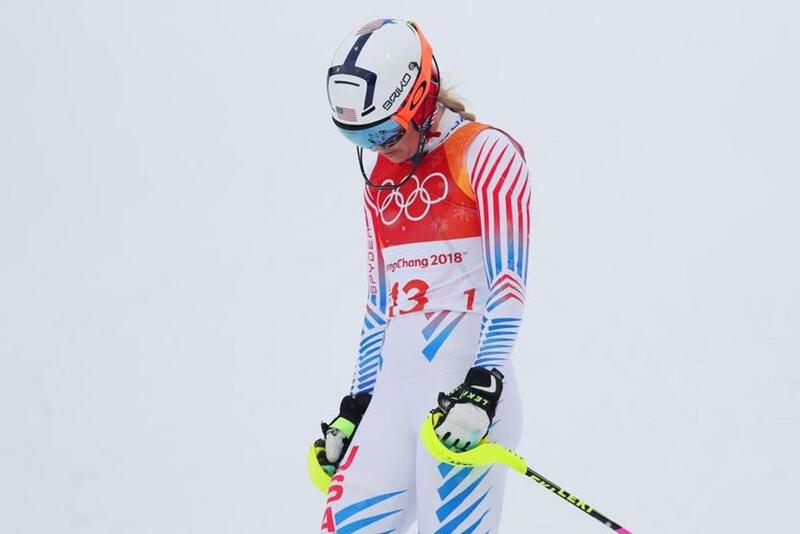 There was no hiding Lindsey Vonn’s dejection after she was disqualified from her gold medal run at the Apline combined after missing a gate on her slalom run. Still, that she was back here at all, that she skied with the memory of her recently deceased grandfather in her heart, that she leaves the sport knowing she gave it everything her body could give, is in many ways more a representation of the Olympic ideal than any ribbon or medal. It was Vonn who offered some perspective on the relentless pursuit of hardware at the expense of the experience, underscoring just how exclusive a club it is to be an Olympic medal winner, or even more precisely, to be an Olympic athlete of any kind. Vonn makes a valid point. But at the same time, sports are inherently defined by results, finished with a score and deciding a winner. The US offered up some valiant victors here in PyeongChang, none more impressive than the women’s hockey team. Unfortunately, at the intersection of bad timing and bad programming, it was a bit hard to see that back home.